A garlicky-sweet glaze coats this pan-roasted steak. Top restaurants across the nation are focusing on Caribbean/Latin cuisine. 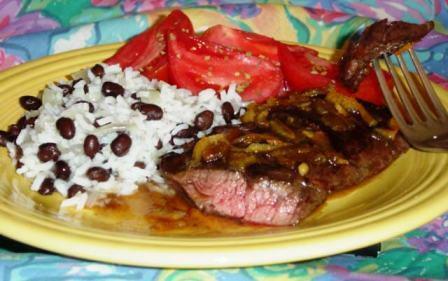 I have created this simple, flavorful, Cuban-style dinner that can be made at home in minutes. Mojo is a Cuban condiment and marinade that is used in many Cuban recipes. There are several versions, but it’s usually made with Seville or sour oranges, spices, garlic, onion and oil. It can be bought bottled in most supermarkets and is sometimes called Spanish barbecue sauce. The bottled version is perfect for this quick, steak dinner. Look for one that is low in fat. Some have no fat. If you can’t find mojo in your store use this quick substitute. Although not authentic, it works well for this recipe. Mix together 1/4 cup orange juice, 1/4 cup lemon or lime juice and 3 garlic cloves, crushed. Add a little salt and pepper to taste and use as the marinade. Black beans and rice is another Cuban staple that’s served with most meals. It’s usually made with black beans that have been soaked overnight and slowly cooked. The beans and their sauce are served with white rice. To make this a quick recipe, I used rinsed and drained canned black beans. Removing the sauce reduces a lot of salt and sugar added to canned beans. Add some sliced tomatoes to complete this quick dinner. Canned red beans can be used if black beans are not available. Any type of quick cooking steak such as flank, sirloin or strip can be used. Make rice and black beans. Remove fat from steak. Heat a non stick skillet on medium high heat and spray with vegetable oil spray. Add steak and saute 3 minutes. Turn and saute 3 minutes. Add salt and pepper to taste to the cooked side. The steak is done when a meat thermometer reaches 145 degrees for rare and 160 degrees for medium. Mix the mojo and marmalade together. Remove the steak to a plate and add the mojo mixture to the skillet. Boil about 2 minutes, scraping up the brown bits in the pan as it boils. Divide the steak into 2 portions and spoon the glaze over each. Makes 2 servings. Bring a large saucepan with 2 to 3 quarts of water to a boil. Add the rice and boil rapidly 7 minutes. Add the onion and continue to boil 3 minutes or until the rice is cooked through but still firm. Drain and place in a bowl. Add the black beans and oil and toss well. Add salt and pepper to taste. Makes 2 servings. 09/04/14 - Syndicated food columnist Linda Gassenheimer, Special wine correspondent Fred Tasker and WLRN host Bonnie Berman interview Chef Michel Sanchez, chef/owner Latin House Grill. He started with a food truck and now has a brick and mortar restaurant and another about to open. He also won best burger from Burger Beast 3 years in a row. He talks about how he created his food truck and turned it into a restaurant and how to make a great burger. 08/28/14 - 1:30 - Syndicated food columnist Linda Gassenheimer, Special wine correspondent Fred Tasker and WLRN host and Bonnie Berman interview Penny Parham, Administrative Director for the Department of Food and Nutrition for Miami-Dade County Schools. Also in studio, Mary Mulder, Director Food Nutrition Services for Broward. What’s in store for school meals and after school activities -- We discuss exciting new food programs including expanded afterschool meals. 08/21/14 - Syndicated food columnist Linda Gassenheimer, Special wine correspondent Fred Tasker and WLRN guest host Peter J. talk about the importance of the bee population, why we are losing so many bees and what is being done about it. John Gentzel, a Homestead Beekeeper is in studio; He is on the Board of the Dade County Farm Bureau. Also joining the conversation is Aaron Mullins, a senior biological scientist at the University of Florida, Ft. Lauderdale Research and Education Center. 07/24/14 - Syndicated food columnist Linda Gassenheimer, Special wine correspondent Fred Tasker and WLRN host Bonnie Berman interview Tim Andreola chef owner Basil Park in Sunny Isles. It features a new concept cooking—intact cuisine (clean balanced cooking). He is also owner with Rodrigo Martinez of Timo a few doors down from Basil Park. 07/17/14 - Syndicated food columnist Linda Gassenheimer, Special wine correspondent Fred Tasker and WLRN host and Bonnie Berman interview Karlisa Callwood, Director of Programs for the Patricia and Philip Frost Museum of Science. She talks about their summer kids camp featuring healthy cooking, also their chromatic cooking (cooking with colorful foods) and the plans for kids in the new museum at Bay Front Park. 07/10/14 - On Thursday’s Topical Currents we’ll look at the latest in food trends with Linda Gassenheimer. She’s just returned from the annual Fancy Food Show and can’t wait to share her favorites with us. There are lots of healthy foods and super foods along with the usual chocolate indulgences, such as smoke-infused chocolate chip cookies. But what about a treat that’s both healthy and indulgent…think - a quinoa sesame chocolate bar? Of course Fred Tasker will give us his wine suggestions. Join us for a full hour of Food and Dining on Topical Currents Thursday at 1pm. 07/03/14 - Syndicated food columnist Linda Gassenheimer, Special wine correspondent Fred Tasker and WLRN host Bonnie Berman interview Dr. Richard Campbell, Fairchild Garden Director of Horticulture and Noris Ledesma Director of Tropical Fruit. We talk about Mango Madness and the Fairchild Gardens Mango Festival. ~~Dinner in Minutes~~ a July 4th sparkler! To make mango salsa, place mango cubes in a medium-size bowl and sprinkle with sugar. Add onion and jalapeno pepper. Mix 1/2 teaspoon cumin and lime juice together and drizzle over ingredients. Add salt to taste. Toss well and sprinkle with cilantro. Remove fat from chicken and pound it flat to about 1/4-inch. This can be done with a meat mallet or the bottom of a sturdy frying pan. Sprinkle the remaining 1 teaspoon ground cumin. Heat oil in a nonstick skillet on medium-high. Cook chicken 3 minutes. Turn and cook 3 minutes. Add salt and pepper to taste to the cooked side. A meat thermometer should read 170 degrees. Remove to a plate and serve with salsa on top. Makes 2 servings. Heat oil in a nonstick skillet on medium-high and add onion and rice. Saute 2 minutes tossing to coat rice with oil. Add water and bring to a simmer. Cover and continue to simmer 15 minutes, until rice is cooked through and liquid is absorbed. Meanwhile, place peanuts in a small bowl and sprinkle with cayenne. When rice is cooked, stir in peanuts and scallions. Add salt and pepper to taste. Makes 2 servings.